Hi friends! Carrots the world’s healthiest food ! Carrots are perhaps best known for their rich supply of the antioxidant nutrient that was actually named for them: beta-carotene. 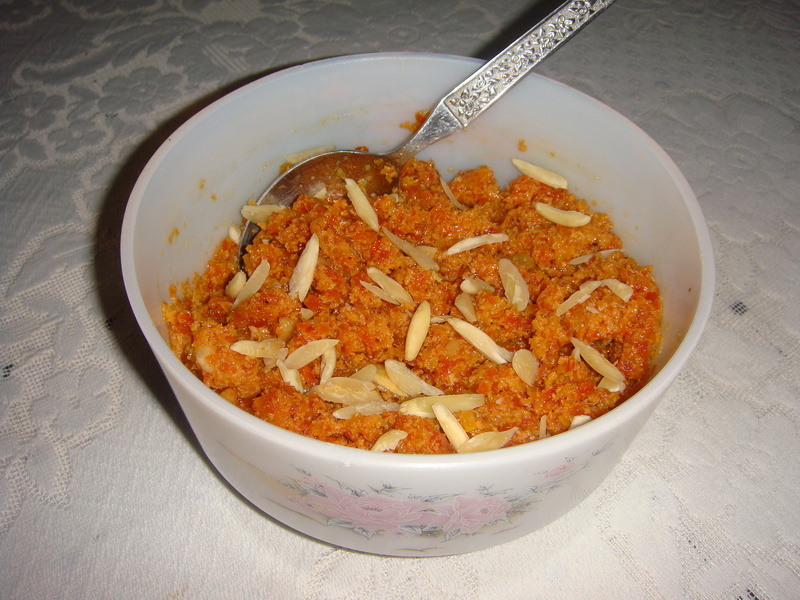 However, these delicious root vegetables are the source not only of beta-carotene, but also of a wide variety of antioxidants and other health-supporting nutrients.Carrot pudding / Gajjar ka halwa is a delicious, halwa /pudding rich with nuts and dried fruits is very popular all over the world. It is winter season dessert in India. Wash the carrots very well, peel and grate and keep aside., soak the Khaskhas / poppy seeds in one cup water for an hour or so. In a deep heavy bottom pan take carrots, milk and cook on a high flame till milk starts to boil. reduce to medium flame till all the milk thickens and reduces and blends with carrots. Add sugar and mix well. Add khaskhas / poppy seeds and ghee to the carrot-milk mix and fry on slow / medium flame till the carrots are well fried and turn darker in color, add cardamom powder, mix well. Add the slivered dry fruit, mix well and turn off the stove. Serve hot in bowls garnished with grated khoya. Prevention of Heart Disease: High cholesterol is a major factor for heart disease. Since regular consumption of carrots reduces cholesterol levels, it is a good idea to consume a healthy dose of carrots, in order to prevent heart-related problems. Blood Pressure: Carrots are rich sources of potassium, which is a vasodilator and can relax the tension in your blood vessels and arteries, thereby increasing blood flow and circulation, boosting organ function throughout the body and reducing the stress on the cardiovascular system. Digestion: Carrots, like most vegetables, have significant amounts of dietary fiber in those orange roots, and fiber is one of the most important elements in maintaining good digestive health. Prevents Cancer: Beta-carotene consumption has been linked to a reduced risk of several cancers, notably lung cancer.